Ivan's 15+ years of back-end and blockchain architecture has seen everything from DBA ops to development of OS kernel modules (FreeBSD). 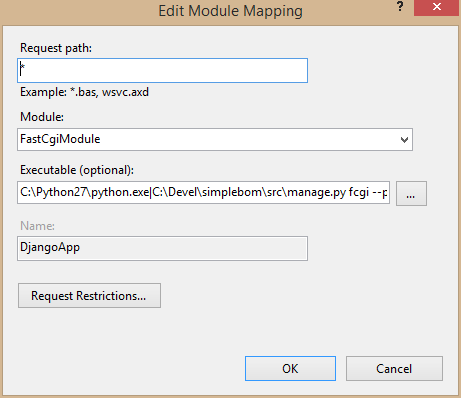 Though many Django Developers might consider it blasphemous, sometimes it is actually necessary to deploy Django applications on Windows/IIS, especially when working with a client that has based its infrastructure around the Windows ecosystem. The “blasphemy” part comes from Django having really been targeted at the Unix environment, relying heavily on features like WSGI, FastCGI, and command-line tooling, all of which are foreign to Windows. Fortunately, Django/IIS compatibility is improving, thanks to the addition of features (which would otherwise be a kludge) on both the Windows and the Python+Django sides of the equation, thereby helping to resolve compatibility issues between these two disparate technical worlds. Pro tip: If you are going to deploy multiple Django (or even plain Python) projects, or if you are a developer, you should look at virtualenv, a tool for creating isolated Python environments. Pro tip: You may also want to install GOW, a light-weight collection of Unix command-line utilities similar to Cygwin. It will provide you with tools such as ls, but also more interesting ones such as make, wget, curl, ssh, scp, gzip and tar. 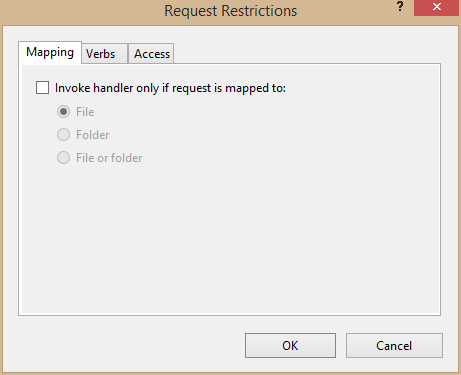 Install the Tracing feature for IIS, then configure it for the Django site in Failed Request Tracing Rules to trace all content (), the status code “500” and the event severity “Error”. The traces will be available as XML files (with attached XSLT) in the IIS’s C:\inetpub\logs\FailedReqLogFiles directory (or a similar one, depending on your configuration). You then need to enable tracing for the particular web site (or a virtual directory) in the *Configure->Failed request tracing… action. Ivan is primarily a back-end developer with 15+ years of experience architecting and implementing server-side solutions, including distributed platforms, such as blockchains, chat servers, and game back-ends. He has handled DBA operations, developed modules for PostgreSQL, and has experience developing firmware for IoT devices. He helped establish the Toptal blockchain specialization, served as a tech screener, and lectured for Toptal Academy. 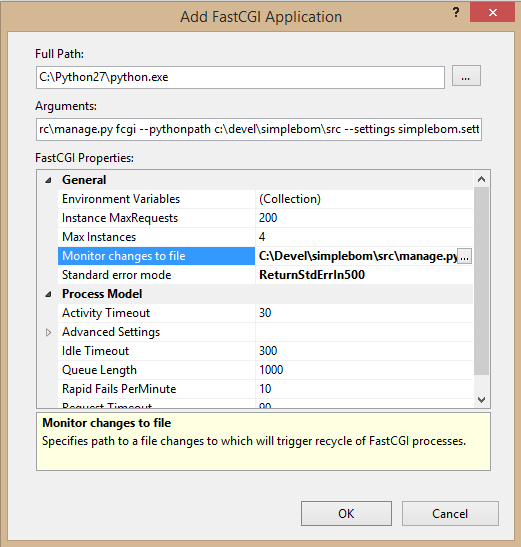 C:\>C:\Python27\python.exe|C:\dev\cloudenv\src\manage.py fcgi --pythonpath C:\dev\cloudenv\src --settings cloudstat.settings Python 2.7.7 (default, Jun 1 2014, 14:21:57) [MSC v.1500 64 bit (AMD64)] on win32 Type "help", "copyright", "credits" or "license" for more information. >>> Traceback (most recent call last): File "C:\dev\cloudenv\src\manage.py", line 8, in <module> from django.core.management import execute_from_command_line ImportError: No module named django.core.management Getting above when configured to run from virtualenv. Can you help on this? Point "C:\Python27\python.exe" to your virtualenv where django is installed. C:\Python27\python.exe|C:\inetpub\wwwroot\django\sbdi_sys\manage.py fcgi --pythonpath C:\inetpub\wwwroot\django\sbdi_sys --settings sbdi_sys.settings HTTP Error 500.0 - Internal Server Error C:\Python27\python.exe - The FastCGI process exited unexpectedly Module FastCgiModule Notification ExecuteRequestHandler Handler FastCGI Error Code 0x00000001 how to fix it ? I am using django 1.9 and I cannot get the FastCGI to work. My old projects in 1.8 were fine. Also can't find static files with DEBUG = False What does Ivan means with "he important step here is to reconfigure the Handler Mappings feature for each of the directories and remove the Django App handler, leaving the StaticFile handler as the most important one."? I tried setting STATICFILES_FINDERS = () but the same... If i serve static flies trough Django with DEBUG = True and STATICFILES_FINDERS = ( 'django.contrib.staticfiles.finders.FileSystemFinder', 'django.contrib.staticfiles.finders.AppDirectoriesFinder', 'compressor.finders.CompressorFinder', ) and in urls if settings.DEBUG == True: urlpatterns = urlpatterns + static(settings.MEDIA_URL, document_root=settings.MEDIA_ROOT) \ + static(settings.STATIC_URL, document_root=settings.STATIC_ROOT) It works, but is django that is serving static files... No idea. Any suggestion really appreciated. I have two different Django apps in a single project or site. I am able to deploy the project in IIS Server and one of the app is working perfectly fine, but my another app show "Server Error (500)" when I try to display it. I would appreciate your answer. for example: "mysite" is django project/site. inside "mysite" i have two different apps such as "app1" and "app2". after following your procedure i am able to deploy the site and one of my app is showing fine but another app is showing Server Error (500). 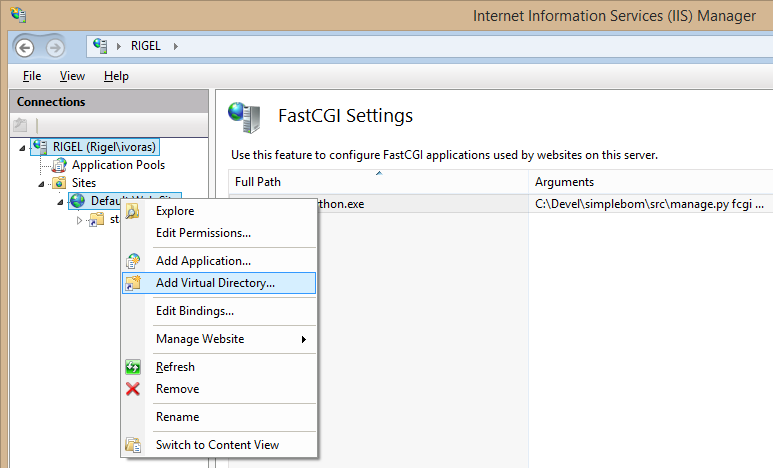 After I install the handler it does ask me to confirm the creation of a matching FastCGI application entry, which I do, but then it does not create the entry. What do I do to debug or fix that?